Perhaps the biggest benefit of PPG Wave 3.V, the Graph page finally makes wavetable synthesis clear and intuitive. I later bought a second‑hand Wave 2.2 and hated it. It hummed and its keyboard was ghastly, so it was soon winging its way to pastures new. Subsequently, I experimented with all manner of alternative wavetable synths, including the Waldorf Microwave II and XTk, and I even owned a PPG Wavecomputer 360B for a while. I also tried Waldorf's PPG 2.V soft synth, but I eventually bought a PPG Wave 2.3 and upgraded it to the latest OS v8.3 from Virtual Music in Vienna. I have never regretted this; it's an instrument of great character, and it has never let me down. But when Waldorf announced Wave 3.V, which promised to combine the quirkiness of the Wave 2.2, the improved capabilities of the Wave 2.3, the sample capabilities and library from the Waveterm B, plus more than 100 new wavetables and a polished 32‑bit wavetable sound, I had to try it. Not the most intuitive of systems, the Browse window nonetheless provides simultaneous access to your stored libraries, the (up to) 128 patches within each library, and the eight Parts currently selected. At first sight, the Wave 3.V graphic interface looks much like a Wave 2.3. However, a closer inspection reveals that the digital section is very different, ditching the clunky sequencer and offering exciting new buttons with names such as Modulation, Transients and Effects. Clicking on any button other than Panel or Group reveals a window containing what looks like a patch list down the left and the requested parameters filling the rest of the space. However, appearances can be deceptive. There is no dedicated patch mode in 3.V; the synth is permanently in what is commonly termed a Multi or Combi mode, so it's always ready to create splits, layers, and multitimbral setups from the Parts in the list. 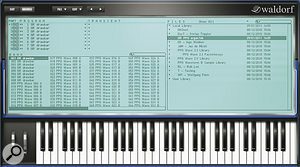 What's more, many of the original PPG keyboard modes — Poly, Quad, Dual and Mono — are also retained for each Part, although the names are mixed up. (For example, Quad on 3.V is the same as Duo 2x4 on the 2.3, and Dual on 3.V is the same as Quad 4x2 on the 2.3.) But, happily, the arcane parameter names and routings of the original PPGs are now gone. Ditching messages such as "UW0 SW0 KW0 KF1 KL4” in favour of sensible parameter names and displays makes 3.V far more accessible than any genuine PPG. Turning first to the Digital window, you'll find that this offers the wavetable parameters and the arpeggiator laid out in ways that make sense to humans. It also offers the ability to switch between three modes of operation, emulating the signal processing and programming idiosyncrasies of the PPG Wave 2.2 and 2.3, as well as Waldorf's earlier 2.V soft synth. Next, the Tune window makes everything much clearer than before, and offers a Fine mode that allows you to detune oscillators in subtle ways that were not possible on vintage PPGs. As for the Modulation window... there's no comparison. While the modulation matrix may seem limited by modern standards, a single click on 'Fine' reveals extra routings and offers percentage values for many of them, which is far more control than any PPG ever offered. Then there's the Global window that, amongst other things, allows you to programme filter cutoff frequency and resonance offsets that emulate the small calibration differences in the original synths. But perhaps the most appealing innovation is the Graph window, which displays the shapes of all three contour generators, the shape and rate of the LFO, the filter response, and the waveforms generated by both the main and secondary ('sub') oscillators. You can grab any of these to alter them, which is about as far from a real PPG as it's possible to get! Then there are the Effects, which can be applied to the whole Combi or on a 'per‑Part' basis. This means that 3.V is truly multitimbral so, if you want your bass-guitar patch overdriven with a splash of chorus, your string pad phased, ping‑pong echo on your lead synth, and your lead-guitar patch distorted and flanged with a touch of reverb, there's nothing stopping you. 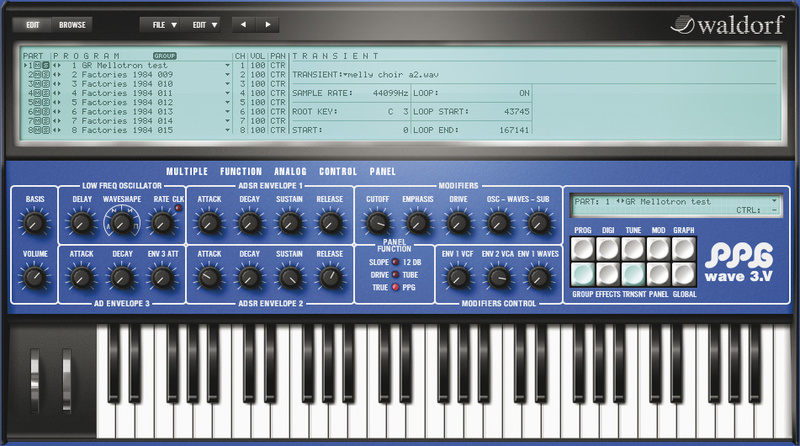 The Effects page makes it quick and simple to set up individual treatments for each Part.Nonetheless, the glossy graphics of most modern soft synths have been discarded in favour of text windows that retain the flavour of the original instruments. Nowhere is this more apparent than when creating splits and layers in the Program window. Whereas most modern synths provide graphic displays for this, you have to type in all the parameters (up to 64 of them!) on 3.V. While these text‑based representations force you to think in a PPG‑ish sort of way (which is perhaps a good thing) their use may compromise simplicity and productivity (which is certainly not). So I decided to test this aspect of 3.V by seeing how quickly I could programme a favourite organ sound that takes more than half an hour of fiddling to set up on my 2.3. First, I dragged the same, simple patch into all eight Parts and renamed it GR Drawbar, so that I could keep track of it. Next, I clicked on the Group button so that every edit was applied to all eight Parts simultaneously. In the Graph window, I dragged the wavetable to the sine wave, created a square loudness envelope, set up the filter to provide a very short click at the start of each note, and created a suitable LFO for vibrato. In the Prog window, I set every Part to respond to the same MIDI channel, and transposed the Parts to the appropriate pitches (0, +19, +12, +24, and so on) to emulate a set of drawbars. Finally, I turned to the Effects and created an EQ curve that enhanced the bottom end and added a bit of scream to the top, and switched on the tube overdrive. The whole operation took less than 10 minutes, and at the end of it I had my PPG organ. Played through a Leslie effect, the results were magic. The only limitation was that there was no way to set up MIDI controllers to affect the loudness of each part individually, so no 'live' drawbar emulation was possible. I could see that 3.V and I were going to be friends. Not calling a sample a sample is confusing, but everything else in the Transient page is clear and straightforward. However, don't expect advanced facilities; the PPGs' sample replay was – and remains – very basic. Wave 3.V is supplied with a library of hundreds of sounds, some of which are excellent, some of which sound very much like a PPG, and some of which my 2.3 couldn't dream of creating. Many use samples as their underlying sound source (see below), but most are generated from the 140 wavetables supplied within 3.V. Some of these — the so‑called 'double wavetables' — contain 128 related waves rather than the 60 related waves, four analogue waves, and 64 'Upper' waves of the vintage synth, but the first 32 tables are recreations of those in my Wave 2.3, making it possible to make a direct comparison between the two. My first job was to create the simplest possible patch, to see whether the underlying timbre was the same. Although the 3.V offers an Init Program option, this sweeps the sound through the selected wavetable, which is not what I wanted, so I created an even simpler patch by opening the filters on both synths, removing any resonance, creating 'square' contours for the VCFs and VCAs, and eliminating all forms of modulation. I then selected the first wave in the first wavetable on each, made sure that 3.V was in Wave 2.3 mode, and played. Given the simplicity of the patch, I wasn't surprised to find that the tones of the two instruments were very close indeed; for all intents and musical purposes, identical. Nonetheless, this comparison confirmed something that I had always suspected; whereas the amplitude contour on the soft synth is square, the sustain level on my 2.3 is somewhat below the final attack level, causing a percussive bump at the start of every note. I have no idea whether this is a fault on my PPG or a characteristic of all PPGs but, either way, I was able to set up the soft synth's envelope to emulate it perfectly. Having done so, the similarity of the two sounds was remarkable. I then selected one of the more complex waves on 3.V and swept through the PPG's wavetable until I found the same wave. Again, the results were so similar as to be interchangeable. The only notable difference was that — as a consequence of its analogue filter and amplifier stages — the 2.3 was more variable from voice to voice than 3.V. You may view this as added character or as imperfection; the choice is yours. My next job was to test those filters. I reduced their cutoff frequencies to zero on both synths, created percussive envelopes and turned the ENV VCF control to maximum on both. This revealed two things: the maximum Decay time is much greater on 3.V, and so is the amount of contour applied, thus extending the range of sounds you can generate with the soft synth. I tweaked 3.V to bring it into line with the PPG and, again, the two were almost indistinguishable. This was getting better and better. It was now time for a sterner test: adding filter resonance. With the filter sweep still in place, I maximised the resonance on both synths and played. Now they sounded different. Perhaps in direct contrast to what you might expect, the resonance on the soft synth was much stronger and deeper than on the original. So I backed it off until the two synths again sounded almost identical, with the resonance picking out the notes' harmonics in the same way on each. An even tougher test was to see whether the soft synth could create some of the discontinuous wavetable sweeps that are so characteristic of the PPG. I applied ENV1 to the wavetable position on both and, again, the sounds were somewhat different. But experimenting with the envelopes and their amounts paid dividends, and within moments I had both synths saying "bloopidy‑deebeedi‑pah” at the same rate and in much the same fashion. You might ask whether different wavetables would reveal greater differences so I checked this too, and yes, differences started to emerge. It was also hard (or sometimes impossible) to make the two synths sound the same when applying complex modulations. But to concentrate on these differences is to miss the point, which is that the underlying sounds and fundamental characters of the soft synth and the genuine PPG were proving to be very similar indeed. Next, I tested whether 3.V in its 2.2 mode could recapture the altered tonality, grittiness and sometimes unpredictable response of the original Wave 2.2. To test this, I switched my Wave 2.3 into 2.2 mode, and compared again. Although the glitches of the PPG were not precisely recreated, the two synths again behaved in very similar fashion. Since I spent much of my time trying to overcome these problems when programming my first PPG, the minor differences in 3.V didn't bother me, and I don't think that they will bother you either. Inevitably, the soft synth can do much more than a PPG, and nowhere is this more obvious than in the addition of the new wavetables, which Waldorf have divided into six categories: Synthesis, Analysis, Mix, Harmonic Split, Voice, and Utterance. Some of these are superb. For example, sweeping through the waves in the Trombone, EPiano and Clavinet tables in the Analysis bank makes it simple to synthesize the instruments that inspired them, whereas a few tweaks — say, applying a modulator to affect the position in the table, or offsetting the sub‑oscillator — can take you off into other realms entirely. What's more, it would be a huge mistake to overlook the high‑resolution (interpolated, 32‑bit) mode offered by 3.V. This is altogether smoother than the vintage modes and, once the excitement of being able to imitate my Wave 2.3 had worn off, I found myself preferring it. When combined with the additional control provided by the Fine programming, it makes 3.V altogether more refined and flexible than any vintage PPG. The Modulation page is a huge step forward from the original PPGs, making it clear what is doing what to what, and by how much. The most important things that the Waveterms added to the PPGs were additive waveform generation and the ability to play a sample (or, in the case of the 2.3 and Waveterm B, the ability to play eight‑part multisamples). Although 3.V doesn't offer any form of waveform generation, it includes sample and multisample playback as standard. Unfortunately, PPG (the company) called a sample a Transient, so that's the nomenclature that has survived here, but the clunky operating system of the Waveterms is gone. You can now drag‑and‑drop or double‑click audio files and multisamples into selected part(s) and then apply any relevant synthesis parameters — filters, overdrive, appropriate forms of modulation, and so on — as before. In addition to this, the manual states that you should be able to use the Osc‑Waves and Env 1 controls to alter the start point and loop points dynamically. This suggests a number of interesting possibilities, because modulating the loop positions of a sample is not dissimilar to wavetable synthesis itself. However, while some of this appears to work, the envelope is not applied, so I view this, at best, as work in progress. To test the Transients section in a more practical fashion, I created a PPG‑o'tron by placing four choir samples in the slots for Parts 1, 2, 3 and 4. I then selected the correct root note for each, switched on looping (whereupon Wave 3.V recognised the loop information contained within the WAVs), set all to the same MIDI channel, and selected an appropriate key range for each. The results were magic, especially when the resulting patch was replayed in either the 8‑bit (Wave 2.2) or 12‑bit (Wave 2.3) modes. I extended the release, closed the filter a little, added EQ to boost the upper mids, and applied some effects. Tangerine Dream would have killed for this sound in the 1970s. There's still much more to applaud in 3.V, as I haven't yet mentioned its ability to generate up to 256 voices simultaneously, nor its 16 outputs, which make it possible to use a single instance as eight independent stereo synthesizers. I've also been remiss in omitting to praise its velocity and aftertouch responses, which are a huge step forward from the horrible kludge of the PPGs, in which the aftertouch value at the moment when a new key is pressed is used as its velocity. But it's only right that I also report a few additional problems I encountered. In truth, there seem to be few voicing problems, other than those already mentioned, and I imagine that these could be resolved in an update. One concerns the 12dB/octave filter mode, which lowers the output level by around 5dB when it should increase it as more high‑frequency components are allowed to pass. Also, the arpeggiator is a bit odd and buggy, although, to be fair, it's nowhere near as awful as the PPG's own. All of its modes are sensitive to the order in which you play the notes, which makes life a bit frustrating if you want a down pattern and are obtaining both ups and downs as a consequence. What's more, the 'Moving' mode only plays over one octave, rather than the number you specify. Consequently, most of my concerns relate to the user interface and other architectural matters. I discovered the first of these by hosting 3.V in both Plogue Bidule and Digital Performer 7.2. (Unfortunately, there's no stand‑alone version.) In Bidule, it reacted to the mouse as one would expect, but in DP it was excruciatingly slow to respond and it could take many seconds for a value to be updated. When editing all eight Parts in Global mode, seconds could turn into minutes, so I would have to say that 3.V is not currently editable within this version of Digital Performer. In the GUI itself, I found that some of the buttons and navigation arrows are uncomfortably small, especially when viewed on a high‑resolution monitor. There's room in the GUI for them to be larger, so they should be. There's also a significant limitation on the MIDI side of things: while you can control much of 3.V using MIDI CC numbers, these cannot be reassigned. Finally, there's 3.V's file management system. This isn't particularly slick, and unexpected operations can cause it to crash (although DP 7.2 was superior to Plogue Bidule in this regard). I think that a general overhaul and prettying‑up of this might be worth considering. I would like to dismiss what I believe to be one of the most enduring but misguided myths about wavetable synthesis. Its reputation for being limited to percussive sounds and delicate, glassy pads is not so much a consequence of what it can do, but rather of what people ask it to do. Wave 3.V can also be deep, warm and very engaging, and I suspect that a walk through some of the sounds in the supplied libraries is going to be a real eye‑opener for many people. Of course, it's inevitable that some will claim that 3.V can't be as good as 'the real thing'. (Oh heck... now we'll have to deal with analogue/digital hybrid anoraks as well as pure analogue anoraks.) But I would happily swap the arcane programming system and dodgy keyboard of a genuine PPG for a legitimate copy of Wave 3.V, a powerful host computer, a host application in which it's happy, and a decent controller keyboard. If you have the second, third and fourth of these, I strongly recommend that you consider obtaining the first. As far as I am aware, no other soft synth specifically recreates the look and feel as well as the underlying architecture of the PPG Waves. But if you fancy a different — and, in truth, far more detailed and more powerful — approach to wavetable synthesis, there's Kubik from ConcreteFX in Holland. This comes with an extensive library of wavetables but, rather than confine you to these, it also allows you to generate new ones by importing waveforms, sample analysis and resynthesis, or even by drawing waves by hand and then interpolating between them. Other advantages over Wave 3.V include the ability to move each oscillator independently within a table, unison oscillators with all manner of combination options, complex waveform LFOs, multi‑mode filters with formant and comb options, eight 32‑stage contour generators, ring modulation, portamento, an X/Y panel, a huge modulation matrix, and more. Kubik is available for both Mac and PC and costs £45 plus VAT$75. PC: 2.6GHz Intel Pentium 4 or AMD Athlon running Windows XP or later, 256MB RAM. Mac/PPC: 1.4GHz G4 running OS 10.3.9, 256MB RAM. Mac/Intel: 1.5GHz Intel processor running OS 10.4 or later, 256MB RAM. Host: Suitable VST or AU host required. In 1975, Wolfgang Palm developed his first synthesizer, the PPG (Palm Productions GmbH) System 100. This was a monophonic modular instrument inspired by Moog's early instruments, and he built very few, replacing it the following year with the System 200 (which may have been a one‑off) and then the System 300, which sold in small quantities and was still available as late as 1978. The same year (1976), Palm released the PPG 1002 (a relatively simple monosynth that has recently been heading toward cult status), followed by the PPG 1020 (the same as the 1002 but with digitally controlled oscillators) and, in what must have been a prodigious burst of creativity, the PPG 1003 Sonic Carrier which, despite calling its oscillators "digitally controlled” on its front panel, appears to have been the first PPG to marry digital waveform generation to an otherwise analogue signal path. This was to prove the inspiration for the next decade of Palm's developments, and the first of the Wavecomputers, the huge 340/380 system and the conventionally sized 360A keyboard, appeared in 1978. These introduced the idea of synthesizing both smooth and discontinuous tonal changes by stepping through waveforms with differing harmonic contents, and it was the eight‑voice Wavecomputer 360B that proved to be the forerunner of the classic PPGs. This was incredibly limited, but the sounds one could obtain from it were so unusual that PPG's marketing blurb suggested that it was "the prototype of a new generation of music synthesizers”, and so it proved to be. In 1981, realising that digital technology could not yet provide the filters that wavetable synthesis cried out for, Palm added analogue filters and a basic sequencer to the 360B's architecture, to create the Wave 2.0, but it was 1982's Wave 2.2 (which was the first PPG polysynth to offer two oscillators per voice) that brought the marque to the world's attention. 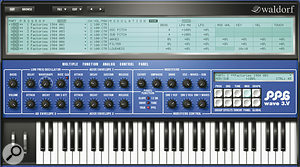 The simultaneous introduction of the Waveterm A, which added wavetable generation, sampling, additive synthesis and sequencing, catapulted the PPG system into 'dream synth' territory which, despite its famously arcane programming system and equally renowned reliability problems, is where it has stayed ever since. Had it not remained extremely expensive in an era of rapidly falling prices, it might have gone on to become one of the most popular keyboards of the era. The Wave 2.3 (1984) was the next big step forward. Based on the previous year's EVA (Expansion Voice Unit) module, this adopted 16‑bit sample playback and 12‑bit DACs rather than the 8‑bit technology of the previous Waves, added eight‑part multitimbrality, and offered MIDI as standard. With the 16‑bit Waveterm B (which appeared in 1985), the EVU, 1986's HDU (an 85MB sampler with real‑time effects processing), and two dedicated six‑octave weighted keyboards, the PRK and PRK‑FD, the Wave family remained desirable throughout the mid‑1980s. So what went wrong? In part, players simply moved on to newer, cheaper and slicker‑sounding instruments from Japan. But in addition, PPG had invested their time and money in the aborted development of a radical new 'modelling' synthesizer, the Realizer. Only a couple of prototypes were ever built, and they didn't work so, in 1987, with failing revenues and nothing new to offer, PPG died. Multitimbrality: Eight parts with grouped or individual stereo outputs. Modes: Poly, Dual, Quad and Mono. Sources: Two wavetable oscillators or one sample per voice. Filter: 24dB/oct emulation of SSM2044, with overdrive; 12dB/oct option. LFOs: One per voice, with MIDI sync. Contour generators: Two ADSR and one AD per voice. Arpeggiator: Up, Down, Alternate, Random and Moving. Effects (per part): Four‑band EQ, overdrive, phaser, chorus, delay, reverb. Wave modes: Wave 2.2, Wave 2.3, Wave 2.V and Wave 3.V. The vintage PPG sound for less than the cost of a world cruise. It's also capable of a much smoother, more refined wavetable sound. True eight‑part multitimbrality: voicing, effects and outputs. More than 100 new wavetables. 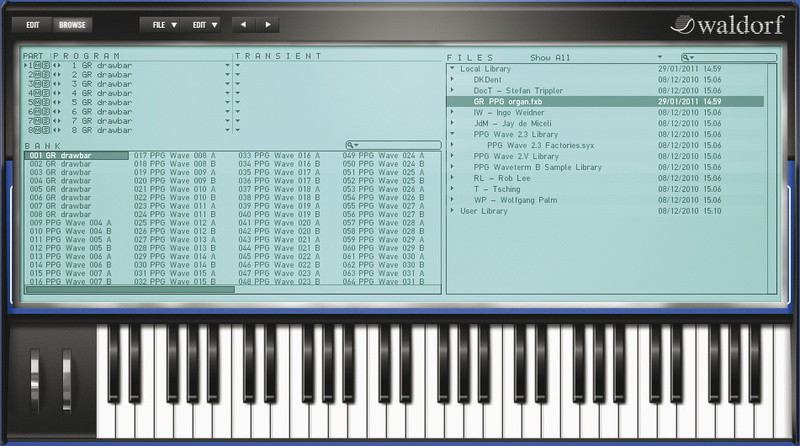 Sample-replay facilities similar to a PPG Wave 2.3 with a Waveterm B. No ability to reassign MIDI controllers. There may be some host interface issues. No ability to generate new waves or build new wavetables. The GUI and file-management system could bear some improvements. Waldorf's PPG Wave 3.V recreates and builds upon the sounds and capabilities of the PPG Wave 2.2 and Wave 2.3 synths, and is a more than adequate substitute for either of these. But more than this, it takes the PPGs' sound into new realms, and its high‑resolution modes of editing and audio generation add a smoothness and refinement that step well beyond the original synths. There are still a few minor issues to sort out, but 3.V nonetheless comes highly recommended. Hand In Hand Distribution +44 (0)1752 696633. PPG Wave 3.V version 1.0.0. Apple MacBook Pro with 2.6GHz Intel Core 2 Duo, 4GB RAM, Mac OS 10.6.6. MOTU Digital Performer 7.2 (VST testing). Plogue Bidule v 0.9708 (VST and AU testing).